Los Alamitos Mayor Pro Tem Warren Kusumoto argues his small city is caught in the middle of a legal fight between the Trump administration and the state of California. California is believed to have the largest population of undocumented immigrants, and the state is on the front lines of the resistance to the Trump administration. But the recent wave of opposition to California's opposition to the administration is turning some heads. Much of it began in the small Orange County suburb of Los Alamitos, where the city council passed a measure last month to opt out of the "sanctuary" law. "I don't like the direction California is [going]," says Warren Kusumoto, mayor pro tem of the city. Kusumoto decided to draft the initiative because he said Los Alamitos is caught in the middle of a national political fight and is being asked to work under conflicting laws. The small city of 11,000 also has close economic ties to the federal government. It is home to several companies with large federal contracts as well as a U.S. military base. But there are also bigger symbolic reasons at play. Kusumoto is frustrated more broadly with state policies on everything from taxes to immigration. "As a state, we've squandered away what the Greatest Generation provided for us," he says. Kusumoto is a Republican and Japanese-American — in his words, a product of immigrants. "I believe my grandparents did it the right way, they were able to immigrate, become naturalized eventually and citizens," he says. "Why is that not the right way for anybody to come over here as immigrants?" In some Southern California suburbs, and in many rural areas, there is mounting frustration that views like Kusumoto's are being crowded out by liberal cities that have gone to battle with President Trump. "When you start to legislate that we cannot cooperate or communicate with another law enforcement partner, that is problematic," says Orange County Undersheriff Don Barnes. Last week, the sheriff's office began posting the release dates of inmates online, using an existing database, they say, to alert federal immigration authorities to potential issues. That move was widely seen as an open defiance to the state government in Sacramento. Sheriff officials had loudly opposed SB-54 when it was under consideration last year. "We shouldn't be mixing public safety with politics," Barnes says. "And there's a crossover that keeps happening that is becoming more politically driven [that is] disregarding the public's safety." Still, it is clear that at least the undercurrent of this recent backlash in Southern California is also political. "It's the dying gasp of Orange County's nasty brand of conservativism that's infected the body politic of the United States for far too long," says Gustavo Arellano, a longtime liberal columnist here. One reason the wave of conservative opposition has turned some heads is that pundits had been predicting that Orange County in particular was beginning to turn blue. In the 2016 presidential race, for instance, the county voted Democratic for the first time since 1936. The demographics have changed dramatically since the 1990s. Whites are now in the minority in the county. But Arellano says more diversity doesn't necessarily mean it's more Democratic. Many of the city councils — and the Orange County Board of Supervisors, which voted to join the Trump administration's lawsuit against California — are still controlled by Republicans. And 2016 may have been an anomaly, he says. "Ultimately, the Orange County dream is suburbia, and suburbia turns even the most fresh-off-the-boat person from Mexico or whatever into a rock-ribbed Republican," Arellano says. So the national political divide is just as sharp — and complicated — in Southern California as it is anywhere else. At heated public hearings, you can see a mix of local grass-roots activists from both sides mingling with Trump supporters who travel from meeting to meeting, some from as far away as Arizona. "Put the lives of Americans and American safety first," said Jennifer Harrison, of Phoenix, who testified this week at a hearing in Escondido. "Americans have dreams too." Earlier this week, Escondido became the latest city to pass a resolution condemning California's sanctuary law, voting to file a legal brief in support of the Trump administration's lawsuit against the state. In Los Alamitos, where the recent backlash began, Warren Kusumoto says he was surprised by all the attention that his council's "opt out" ordinance got. He also resents that some on the left have cast his city as some sort of anti-immigrant enclave. "I may be anti-illegal immigration, but I don't hate people," Kusumoto says. Los Alamitos leaders aren't sure whether their decision will hold up if it's challenged in court. But, they say, it has started a much needed debate. This week, the city of Escondido north of San Diego became the latest in Southern California to pass a resolution condemning California's sanctuary law. That law aims to protect some immigrants in the country illegally by limiting cooperation between local law enforcement and federal immigration authorities. NPR's Kirk Siegler reports on what appears to be a growing opposition to California's opposition to the Trump administration. KIRK SIEGLER, BYLINE: Nearly a dozen local governments have now voted to oppose California's sanctuary law. Some like Orange County have even joined the Trump administration's legal challenge to the state. Now, this recent wave of opposition started in the small Orange County suburb of Los Alamitos. UNIDENTIFIED PROTESTERS: (Chanting) USA, USA, USA. SIEGLER: Protesters holding signs saying make California great again celebrate after the city council votes to opt out of the state's sanctuary law. UNIDENTIFIED PERSON #1: Brave patriots - brave, American patriots. UNIDENTIFIED PERSON #2: America first. 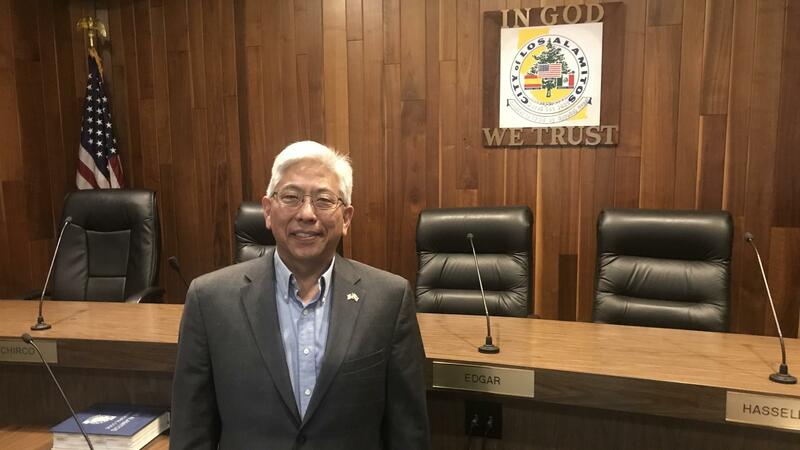 SIEGLER: Two weeks later in a now empty quiet chamber, Los Alamitos Mayor Pro Tem Warren Kusumoto reflects on his decision to draft the ordinance and take a stand against liberal California. WARREN KUSUMOTO: I don't like the direction that California's in. I mean, there's - we've - as a state, we've squandered away what the greatest generation provided for us. SIEGLER: He's frustrated with policies on everything from taxes to immigration. Kusumoto is a Republican and is, in his words, the product of immigrants. His grandparents originally moved from Japan to Hawaii. KUSUMOTO: I believe my grandparents did it the right way. They were able to immigrate, become naturalized eventually and citizens, so why is that not the right way for anybody to come over here as immigrants? SIEGLER: In some Southern California suburbs, there's mounting frustration that views like Kusumoto's are being crowded out by liberal cities that have staked their claim as being the front lines to the Trump resistance. Kusumoto says Los Alamitos is caught in the middle and is being asked to work under conflicting laws. That's a similar argument espoused by the Orange County undersheriff, Don Barnes. DON BARNES: When you start to legislate that we cannot cooperate or communicate with another law enforcement partner, that is problematic. SIEGLER: Last week, the sheriff's office decided to post the release dates of inmates online, they say, to alert federal immigration authorities of potential problems. It was seen as an open defiance to Sacramento. BARNES: We shouldn't be mixing public safety with the politics. SIEGLER: Still, it's clear the undercurrent of this backlash being seen in Southern California right now is also political. GUSTAVO ARELLANO: It's the dying gasp of Orange County's nasty brand of conservatism that's infected the body politic of the United States for far too long. SIEGLER: Gustavo Arellano is a longtime liberal columnist here. In 2016, Orange County voted Democrat in the presidential election for the first time since 1936, and that was widely attributed to changing demographics. Whites are now in the minority in the O.C. But Arellano says just because it's getting more diverse doesn't necessarily mean it's more democratic. ARELLANO: Ultimately, the Orange County dream is suburbia, and suburbia turns even the most fresh-off-the-boat person from Mexico or whatever into a rock-ribbed Republican. SIEGLER: So the national political divide is just as sharp and complicated in Southern California. At heated public hearings, you can see a mix of local, grassroots activists from both sides but also some of the same Trump supporters traveling from meeting to meeting, some from as far away as Phoenix. In Los Alamitos, where the recent backlash began, Warren Kusumoto resents the fact that some are casting his city as some sort of anti-immigrant enclave. KUSUMOTO: Some will say, hey, well, you're racist. No, that's not true. I'm not, right? I'm maybe anti-illegal immigrant immigration, but not - I don't hate people. SIEGLER: Los Alamitos leaders aren't sure whether their ordinance will hold up if it's challenged in court, but they say it started a much-needed debate. Kirk Siegler, NPR News, Orange County, Calif. Transcript provided by NPR, Copyright NPR.